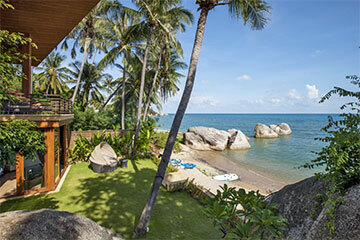 An imposing luxurious beachfront villa in a dramatic setting, with numerous water sports facilities. Amenities satellite plasma TVs, DVD players, iPod docks, fibre optic WiFi internet, X-Box 360 with games, outdoor projector, air-conditioned bedrooms, fully equipped kitchen, BBQ, kayaks. Baan HinYai is a striking 5 bedroom beachfront home, set amongst huge granite boulders on the east coast of the island, just south of Lamai. The villa is raised above the scenic beach for enhanced privacy and security, with gated access to the property. Sunrise views across the sea include the venerated natural landmark rock formations of Hin Yai and Hin Ta at the northern tip of the bay. This unique property is generously proportioned, with soaring 10 metre ceilings, and slide-away glass walls that allow for seamless indoor-outdoor living. Many of the granite boulders are integrated into the building as architectural features, while others provide a dramatic backdrop in the gardens. The immense boulders continue onto the beach and into the sea, and are a dominant feature of the property. To compliment the natural rock formations, Baan HinYai is designed with a strong focus on natural materials, including sandstone flooring throughout, rich tropical hardwood timber frames, panelling, and furniture, as well as cedar shingle roofs. At the centre of the villa is a beautiful stone-tiled infinity-edge swimming pool, with a large shallow ledge for kids or sun-bathing, flanked by a sandstone deck furnished with sun loungers. The pool deck continues to a veranda in front of the main living room, with lounge chairs and outdoor sound system. Adjacent to the pool is a spacious sala with BBQ kitchen and al-fresco dining set. The huge open-plan living room includes a lounge with sofas and coffee tables and a large satellite plasma TV/DVD system. A huge wooden dining table seats up to 20, and is served by the fully equipped kitchen. The living area is fitted with an array of fans, and the overhanging roof and high ceilings help to maintain a comfortable climate. The five luxurious air-conditioned bedroom suites at Baan HinYai include 4 Kings and 1 twin, and feature built-in wardrobes, sea views, large satellite plasma TV/DVD systems, and en-suite bathrooms with walk-in rain showers and free-standing terrazzo tubs. Baan HinYai is conveniently located in southern Lamai, within walking distance of hotels, bars, restaurants, shops, spas, and the famous Hin Ta Hin Yai landmark, and a Buddhist temple. For larger parties, Baan HinYai can be combined with the neighbouring sister property, Baan HinTa. On the southeastern coast of Koh Samui, some 30 minutes from the airport, 40 minutes from the golf course, 20 minutes from Chaweng, and 5 minutes from Lamai. 5 bedrooms, sleeping up to 10. 4 bedrooms, sleeping up to 8. -Rates are inclusive of continental breakfast, in-villa chef service, and airport transfers, one trip each way. -Additional airport transfers are charged at $50+ USD per trip, and subject to 7% tax. 30% discount until 31 January 2019. Applicable to all ocupancy rates, and cannot be used in conjunction with other promotions. 15% discount for booking made 120 days or more in advance, except for CNY and Easter, when 5% discount applies to bookings made 150 days in advance. Applicable at all occupancy rates, and cannot be used in conjunction with other promotions. Not applicable to Xmas/NY. Services of property manager and 5 full-time staff. A full-time Thai chef at your disposal. Daily continental breakfast, and maid service. Thai massage, oil massage, facial, body-wrap, manicure or pedicure in the privacy of your villa.